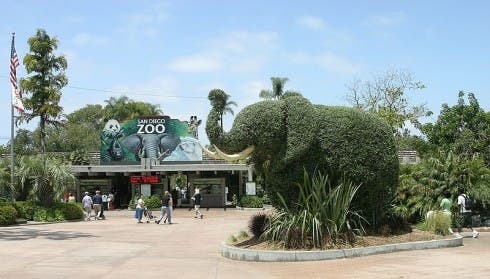 The San Diego Zoo will be adding a solar photovoltaic canopy system and five electric vehicle chargers. Construction began on the ten solar canopies Sept. 4, and when completed they will generate 90 kW of electricity. The electricity will be used to charge EVs and for storage in a 100-kW battery system. Excess electricity generated by the panels will be directed back to the grid. The new solar canopies will also provide shade for about fifty cars. The zoo receives millions of visitors each year, and the solar canopies and EV chargers will be part of an educational experience about clean energy, so there will be an educational benefit to installing the new system as well. “By providing a sustainable energy mechanism at a well-known destination like the Zoo, we are not only raising awareness for this technology but we are making this option available to guests that we host from all over the world”, said John Dunlap, Director of the San Diego Zoo. It should be noted that many children visit the zoo, so they will be able to learn about animals, clean energy, and climate change in one setting. It might be worthwhile in the Solar-EV exhibit to mention the impact of fossil fuels and climate change on polar bears, because the zoo has its own, which you can see on its polar bear cam. The zoo is working with Smart City San Diego on the EV-Solar project. This organization is a collaboration between UC San Diego, San Diego Gas & Electric, GE, and CleanTECH San Diego. It works on bringing organizations together to help the city have responsible, sustainable energy policy and usage. For example, in addition to the zoo project, it works on smart appliances, stored energy systems for photovoltaics, economic development and similar efforts.